I love being married to a teacher. The time he has off in the summer is a sanity saver for me for sure. He does SO much around the house that I am not exactly great at. He helps me with the dishes, the laundry and anything else I need his assistance. He also takes the girls almost everyday to do something fun and get out of the house. Pool, bank, park... you name it. 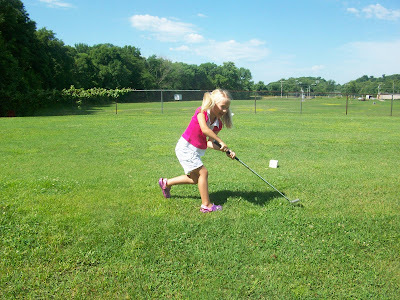 The girls and I are unable to get out very often during the day throughout the school year due to the fact that I watch 3 to 4 other children during the day on top of my crazy three girls! The truth is, it isn't exactly a walk in the park loading up 7 kids in the car to run an errand or go to the pool. Can you imagine taking a 6 month old, an almost 7 month old, a 11 month old, a 14 month old, a 2.5 yr old, a 3 yr old & a 5 yr old to the pool?! 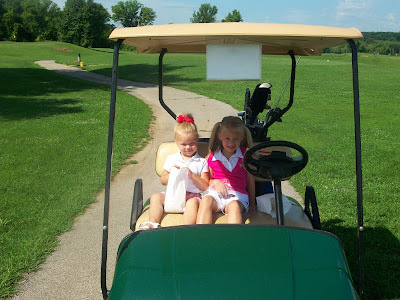 So a few weeks ago my fabulous hubby, Steve, took our girls on their first EVER golfing adventure. 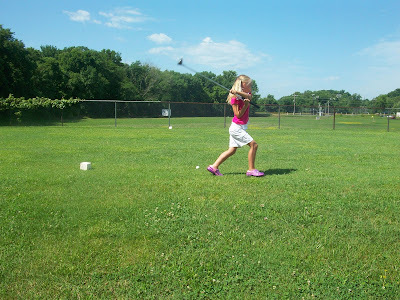 Sophie trying to hold the HUGE golf club was an issue in itself. 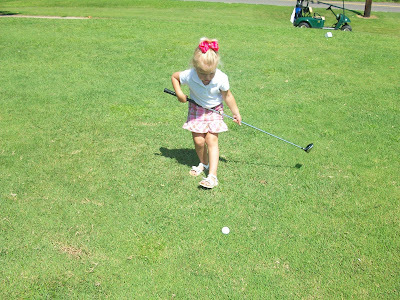 And I LOVED getting them dressed in the cutest GOLFY outfits I could find. 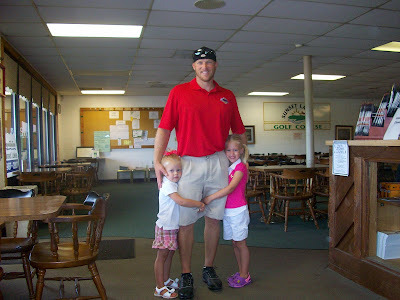 A cute pose with Daddy after their 9 holes were done. I love when the girls have DADDY time since I am with them 24/7. I can't wait until I get my teaching degree so I can teach when all my girls are in school. Can you say SUMMER'S OFF? Too cute! Nothing like a little daddy, daughter time. Oh my gosh...he is a keeper!! 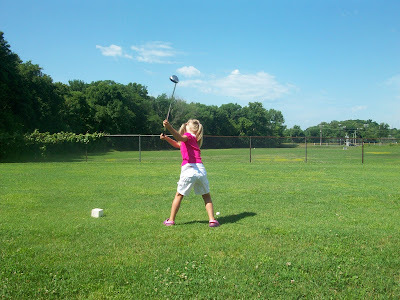 Your little budding golf pros are almost ready for the tour!! They are so adorable!! so cute! this is Sienna's new thing too. 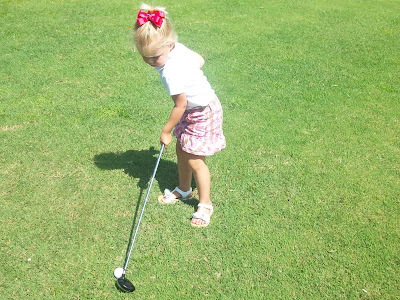 have you seen my lil golf girl line? i created it just for her mostly. 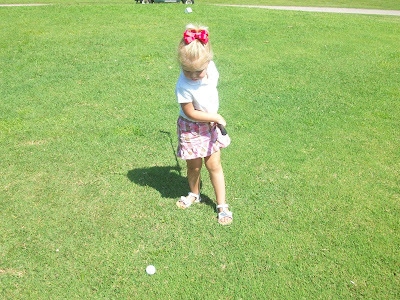 she goes with daddy to the golf course most nights! How cute! I bet they all had a blast! !